Filing with eFiler is quick and easy. 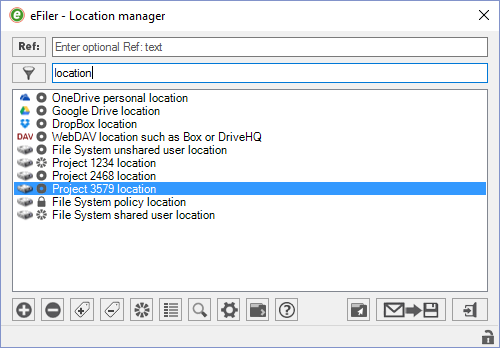 With its filing location prediction eFiler makes sure the folder you want to file emails into is at or near the top of the list, or you can file using the Cloud Sync or Drop Panel to drag and drop your emails into folders in your LAN or cloud file systems. The bulk folder export feature allows you to export a folder and its subfolders and all the emails they contain replicating the folder structure so you can keep your familiar personal setup. File into folders without having to add them to your list. When you add a new location eFiler can automatically replace the ugly UNC path with easy to read labels which you can customise. Use the filter as shown to help to find a folder and enter a filing reference in the Ref: box to help comply with your QA scheme. eFiler communicates directly with Google Drive, DropBox and OneDrive (personal) and you can connect directly to Sharepoint Box and DriveHQ accounts via WebDAV for true cloud storage and search without having to have sync software installed.